This knowledgebase article deals with identifying common problems in RapidWeaver (which may prevent RapidWeaver or your website functioning correctly) and attempts to provide general advice on resolving these issues. Please remember that RapidWeaver is developed by Realmac Software; not ThemeFlood. Therefore if you encounter issues not discussed in this article or you are unable to resolve a particular issue, please escalate your case to Realmac Software or ask on the community forums for help. If you've recently switched to using ThemeFlood themes or made other significant changes to your website, you may find that the physical pages and content of the site get published, but styling and images are missing. You might find your browser console is listing lots of missing files, as picture below. Very often if you are seeing a difference between the offline and online versions of your website, this indicates that the website has not fully uploaded. The first thing to check is that your publishing settings in RapidWeaver are correct. Carefully scrutinise your settings to ensure the website address and publishing path are correct. The second thing to try is to Mark All Pages as Changed from the RapidWeaver File menu. 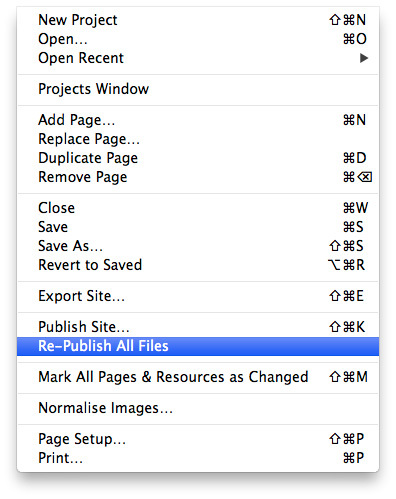 Then click the Re-Publish All Files option in the RapidWeaver File menu. This action will force RapidWeaver to republish the entire website again. It may take a while, but should hopefully solve any publishing issues you were having. More serious publishing problems (like an inability to start or complete a publishing session) are most likely attributed to publishing settings being incorrect or a fault on the web server you are trying to upload the files to. This is particularly true if you're seeing errors relating to things like 'failed to create remote directory'. In these instances, it's best to contact the web hosting company for help and tell them what settings you are using. Refresh your web browser to make sure you are seeing the latest version of a webpage. Some web browsers (like Safari) have quite strong caching and may still be showing you an older version of a page. Is the website being published to the correct location? Most websites need to live inside a /public_html/ or /htdocs/ directory on your server. If the publishing path in your settings is wrong, the website may still get punished, but might be in the wrong location on the web server. A longstanding bug in RapidWeaver 5 would sometimes cause publishing to fail every time, if you had not saved the FTP details as a bookmark. You can read many documented cases about this on the RapidWeaver forums. If you are using RapidWeaver 5 and constantly hitting publishing problems, try saving your server settings as a bookmark in the RapidWeaver publishing window. For some users, this simple action resolved publishing errors permanently. Unless major changes happen to every page in your website, RapidWeaver should only publish what has changed and leave unchanged pages alone. This feature is often known as smart publishing. You should always have smart publishing enabled in RapidWeaver > Preferences > Advanced. Smart publishing will ensure smaller website changes are published more quickly. Also of note, it is normal for publishing over SSL (https) to take longer, compared to a normal insecure (http) connection. ThemeFlood themes are intended to be setup and published with CSS Consolidation enabled. CSS Consolidation merges multiple CSS files into singular files. This process can improve page loading speed and resolve several longstanding issues; including missing font icons or embedded web font faces and Internet Explorer compatibility problems. Always have CSS consolidation enabled in your RapidWeaver projects. CSS consolidation and compression was added in RapidWeaver 5, and can be located in the Publishing tab of the RapidWeaver Preferences window (pictured below). By default, CSS consolidation should already be turned on. If you find that CSS consolidation is not turned on, then you should switch it on right now. CSS compression in RapidWeaver 5 is optional (this feature was removed in RapidWeaver 6). 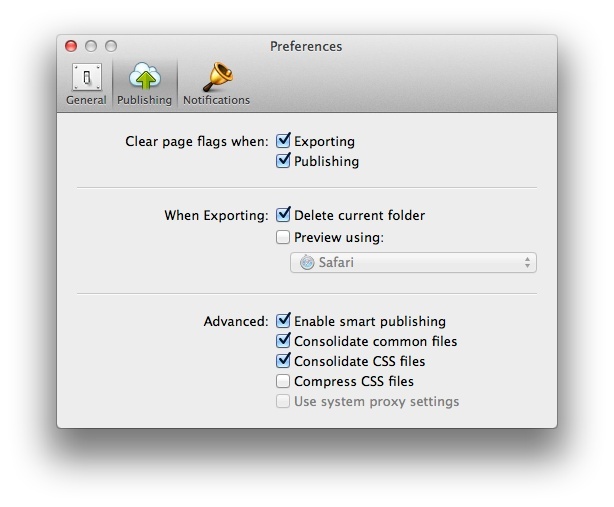 In RapidWeaver 6, CSS consolidation settings can be toggled on and off on a project-by-project basis. These settings can be accessed by opening the Site Settings and clicking on the Advanced tab in the sidebar, pictured below. The setup is similar in RapidWeaver 7 too. What CSS consolidation does is to amalgamate multiple theme stylesheets into just two – one dealing with screen styles and another handling your printer styles. Normally every RapidWeaver theme style setting will add a new stylesheet to a page, so in some themes the number of stylesheets can mount up dramatically. Most importantly, this means that with CSS consolidation turned on, you safely avoid the strict 28 stylesheet limit that Internet Explorer imposes on all websites (if you surpass this limit, then your page design will start falling apart when viewed through Internet Explorer). CSS consolidation can also make a noticeable improvement to the speed at which your pages load, because the web browser is making far less HTTP requests and therefore is requiring less bandwidth and files to render each page. This somewhat cryptic error message can occur for one of several possible reasons. It can occur at any time, such as previewing a page, exporting, saving or publishing. Some users have found that turning off CSS Consolidation will fix the problem short-term. However this is by no-means a longterm or reliable fix and the issue will still prevail below the surface and can occur again. Of course turning off CSS Consolidation carries major compatibility and performance implications of its own. So it's always best to discount CSS consolidation from the equation and fix the problem correctly and fully. Ensure that all RapidWeaver plugins you have installed are the latest versions. This is particularly true of plugins like PlusKit and Stacks. Don't rely solely on auto-updaters; instead compare your version number with the version number shown on the website.Download and apply all updates available. Uninstall and delete old or obsolete RapidWeaver addons. Typically anything that has not been updated in the last two years should be considered obsolete. The only exception to this rule is if the developer states on the website that the addon has been tested and confirmed to work with your exact version of RapidWeaver or can provide verbal assurances of such. 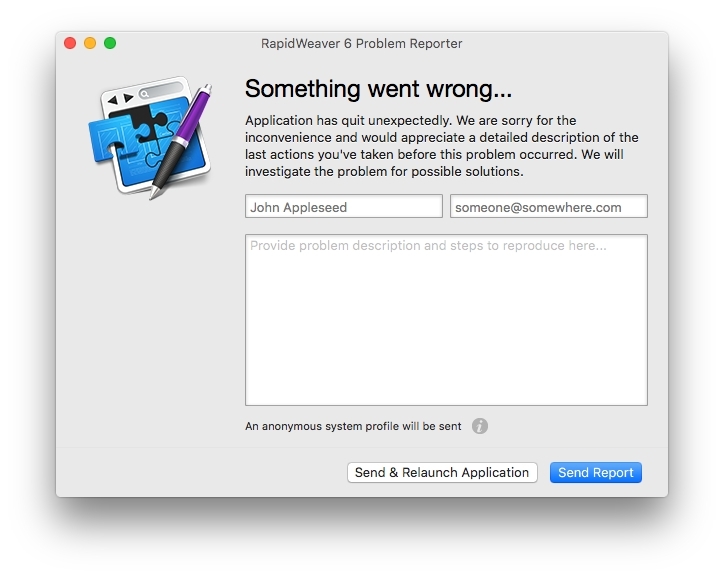 Try deleting RapidWeaver from your system Applications folder. Then re-download and install RapidWeaver again. All addons and sandwich files should be safe, because these are stored elsewhere on your computer. Reinstalling wipes nearly all traces of RapidWeaver off your system and installs it from fresh. Over time, this has proven to be the most reliable way to fix the 'out of bounds' error. If your website makes use of a contact form, make sure the form fields match-up to the correct attributes in the RapidWeaver Page Inspector. If for example the email subject is set to the email field, this can cause errors. Check all settings are correct and correctly match-up. Use a free tool like Onyx to scan your system and fix incorrect file permissions. You should also try running daily, weekly and monthly maintenance tasks and reset caches. Onyx is safe and easy to use and can fix problems deep in your system. 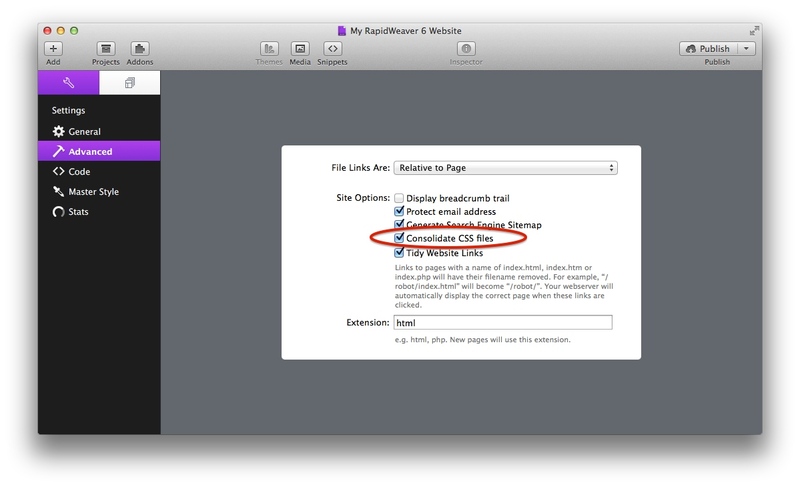 Make sure RapidWeaver is installed in your Applications folder. This may sound really obvious, but in the past some people have tried moving the RapidWeaver app off into another location - like a mountable volume, network attached storage or a Dropbox folder. This can often result in problems occurring and is not recommended. Avoid putting large files in a RapidWeaver project. High-definition images and large video's will really slow-down RapidWeaver and can make it more unstable. Big images and video should instead be warehoused and published separately to your main website. Anything over 10MB in size would be considered 'large'. If problems persist, then you should contact Realmac Software by opening a support ticket on their website. Your message should include the exact error message or code, a copy of your RapidWeaver sandwich file, a list of installed third-party addons and details of your computer. Click Apple > About this Mac from the main menu and choose the option to view more information and save the system profile. Console logs from console.app may also be useful, as these might explain what happened immediately before the error occurred. These can occur for any number of reasons. In the event of a crash, you should get prompted to send a crash report (pictured below) which you should fill-in with your name, email and details of what happened immediately before the crash happened. If you get no response to your crash report after a few days, follow it up with a new support enquiry sent via the Realmac Software website. Especially if the problem is replicable or effects a certain project file. Use the same name and email address each time, so that Realmac Software can track your chain of correspondence. The contact form page type is a page type supplied with RapidWeaver. It's functionality is not dependant on any particular RapidWeaver theme. A theme will only apply styling to the RapidWeaver contact form. Sometimes you might find that messages sent through the contact form are not received. This can happen for any number of potential reasons. You should always periodically check that your RapidWeaver contact forms are functioning. It's wise to send a test message every month to yourself. If you suddenly stop receiving messages, test your contact form to make sure it is working correctly. It is also recommended practice to provide other methods of contact for your website users, and not rely solely on the RapidWeaver contact form. If you're finding that all links and icons on on a webpage are broken, make sure they've been configured correctly within RapidWeaver and ensure that CSS consolidation is enabled. If certain links or icons on a webpage are failing to display in some web browsers (but not others), this might indicate they are being blocked. You should check the settings of any installed ad-blockers or similar software to ensure no page content is being prevented from displaying.